Ok, so I loooove sushi. I could eat sushi pretty much anytime. I often get intense cravings for it. It doesn't help that there's a sushi restaurant in the same building as my gym. Every time I go to work out, I have to walk right by the place! Since sashimi grade fish is typically a little out of my price range (and takes extra effort to acquire), I usually just make veggie sushi, which is just as good. I never would have thought I could make my own sushi, but a friend of mine gave me a quick lesson and I've been rolling my own seaweed ever since. It's so much cheaper than going out! And it's easy. All you need is a sushi mat, nori and some tasty fillings. In honor of Mother's Day, this one is my Mom's classic pie she brings to all special occasions, and it always looks gorgeous. It's from the 80's, and utilizes the microwave (ooh la la). Pre heat oven to 300. Transfer crust to glass pie pan. Prick crust and brush 1 egg yolk over crust. Cook on high (in microwave) 6 minutes, until brown. Combine next 5 ingredients, and stir until cornstarch is dissolved. Cook uncovered until thick and clear, about 7 min. Add butter and lemon rind, blend well. Beat remaining 5 yolks until thick. Whisk into lemon mixture, mix well. Cook on high 2 min, whisk again. Continue cooking on high 1 1/2 minutes. Pour into pie shell. Beat egg whites with cream of tartar, add 1/2 C sugar gradually and beat to soft peaks, add vanilla and continue beating until peaks form. 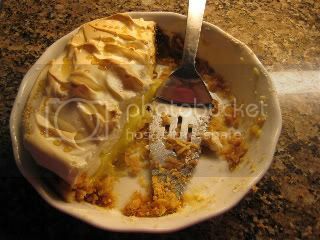 Pour meringue onto pie filling, and form into peaks. Bake in oven for 10 minutes until lightly brown. This one's from the 80's, originating with my Grandma Barbara Reid (who is by no means Chinese). 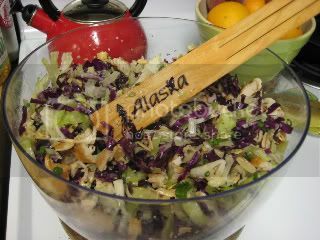 This salad is quite tasty, and cheap to make. I am sure there are ways to make it a little more authentic. It's a perfect summer dish. These are the best cupcakes! They are named for Jackie, the neighbor lady my mom got the recipe from back in the 80's. 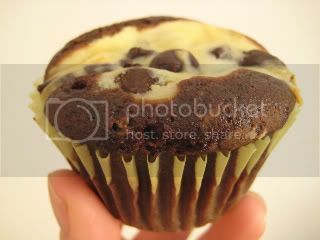 These cupcakes are chocolate with a cream cheese chocolate chip filling. They are usually requested for special occasions, such as birthdays. Pre heat oven to 350. Cream together egg, cream cheese, salt, sugar. Stir in chocolate chips and set aside. In a separate bowl sift together flour, sugar, cocoa, baking soda, salt. Add water, oil, vinegar and vanilla. Line cupcake tins with paper cups and fill with chocolate batter half way. Add a tablespoon of cream cheese mix to center of each cupcake. Bake 25 minutes. Enjoy! I have never made a quiche before, and I am realizing now that is a very big mistake on my part. They are delicious and fairly easy to make. I got this recipe from my CSA box, and this is the only way I have found I like to eat kale. Preheat oven to 350. Slice kale into thin ribbons, then spin in salad spinner if needing a wash. Heat the oil in a pan, then add onion and cook until soft and tender. Add kale and saute another few minutes until tender. Remove from heat and salt and pepper to taste. Beat eggs and milk together until frothy. Add kale mixture to pie crust and stir in cheese. Pour eggs on top and gently stir in. Bake 35-45 minutes until set in the middle. Cool 5 minutes before serving. Baked tofu is one of my favorite things... but then again, I have a lot of favorite things. In college, I used to make sandwiches with slices of the thick baked tofu, onions, tomatoes and lettuce. The cool, savory density of the tofu was the best part. I could eat those sandwiches everyday. I could also eat baked tofu on its own---except, before I knew it, I was not living off of my student loans anymore and I had to reassess how much I was willing to pay for the things I wanted. I suddenly realized that baked tofu is quite expensive--nearly $5 for two little pieces! The cheapest I've found it so far is at Trader Joe's for about $3.50. It occurred to me one day that this high cost was in fact rather odd, since plain old tofu is really cheap. I can buy a whole pound of it for just over a dollar. So, I thought, why don't I try to bake my own tofu and save a ton of money? There are a number of recipes out there, but they all consist of marinating the tofu in your choice of flavorings and then baking tofu pieces in the oven. Easy! 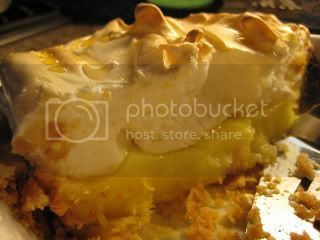 I made this version recently---a slight variation of an allrecipes.com recipe. Slice your tofu into 1/2 inch sections. With a towel, slightly press on the tofu until it releases any moisture. (You can leave a heavy plate on top of it for awhile, but I just use my hands.) Cut the slices into 1/2 inch cubes. Mix the rest of the ingredients into a bowl (or directly into the container you will use to marinate the tofu). Add the tofu cubes and stir to coat. Let marinate for at least 5 minutes, or up to over night. Pre-heat your oven to 375 degrees. Prepare a baking sheet with a non-stick spray (or next time I will try covering a baking sheet in foil--I'm still scrubbing the last pan) and arrange tofu in a single layer. Bake tofu for 10 minutes and then toss the cubes, allowing a new surface of each one to touch the pan. Repeat every 10 minutes until tofu is golden and slightly cripsy on some sides---30 to 40 minutes. *I think these taste the best cold. Be careful--once you are eating, it's hard to stop! This recipe is taken from Cook's Illustrated and is just great. 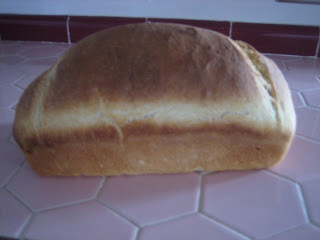 It's fairly fool proof just follow the instructions and you'll have a nice looking loaf of homemade bread! Adjust oven rack to lowest position and heat oven to 200 degrees. Once the oven temperature reaches 200 degrees, maintain the heat for 10 minutes, then turn off the oven. Mix 3 1/2 cups of the flour and the salt in the bowl of a standing mixer fitted with the dough hook. Mix the milk, water, butter, honey, and yeast in a 4-cup liquid measuring cup. Turn the machine to low and slowly add the liquid. When the dough comes together, increase the speed to medium and mix until the dough is smooth and satiny, stopping the machine two or three times to scrape dough from the hook, if necessary, about 10 min. (After 5 minutes of kneading, if the dough is still sticking to the sides of the bowl, add flour, 1 tablespoon at a time and up to 1/4 cup total, until the dough is no longer sticky.) Turn the dough onto a lightly floured work surface; knead to form a smooth, round ball, about 15 seconds. Place dough in very lightly oiled large bowl, rubbing the dough around the bowl to coat lightly. Cover the bowl with a damp cloth and place it in the warmed oven until the dough doubles in size, 50 to 60 minutes. Gently press the dough into a rectangle 1 inch thick and no longer than 9 inches. With a long side facing you, roll the dough firmly into a cylinder, pressing with your fingers to make sure the dough sticks to itself. Turn the dough seam-side up and pinch it closed. Place the dough seam-side down in a greased 9 by 5-inch loaf pan and press it gently so it touches all four sides of the pan. Cover with damp cloth; set aside in warm spot until the dough almost doubles in size 20-30 min. Keep one oven rack at the lowest position and place the other at the middle position and heat the oven to 350 degrees. Place an empty baking pan on the bottom rack. Bring 2 cups of water to a boil in a small saucepan. Pour boiling water into the empty pan on the bottom rack and set the loaf onto the middle rack. Bake until an instant-read thermometer inserted at an angle from the short end just above the pan rim into the center of the loaf reads 195 degrees, 40 to 50 minutes. Remove bread from the pan, transfer to wire rack, and cool to room temperature. Slice and serve.